Georgia Jackson, BSN, RN, MPH, unit director of 71 ICU and Jesse Jacob, MD, associate hospital epidemiologist, glove and gown each time they enter a patient's room on 71 ICU. The medical ICU is participating in a national infection control study looking at ways to reduce hospital-associated infection rates. Jacob is the principal investigator of the BUGG Study at Emory University Hospital Midtown. Emory University Hospital Midtown's (EUHM) medical intensive care unit (71 ICU) has been selected to participate in a nationwide infection control study, looking at ways to reduce hospital-associated infection rates. The hospital's ICU is one of 20 ICUs in the country, and the only one in Georgia, chosen to participate in an important study that could impact the way critical care is delivered around the country. The study is called the Benefits of Universal Gloving and Gowning (BUGG). Health care workers in half of the ICUs participating in the study will wear gloves and gowns, referred to as "contact isolation", for all room entries and patient contact (intervention arm of the study), while health care workers in the other participating ICUs will follow the current standard of care (control arm of the study), which requires use of gloves and gowns only for room entry and contact with patients with known resistant bacteria. 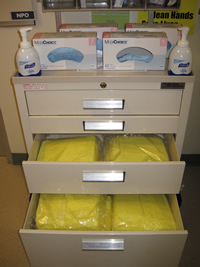 Emory University Hospital Midtown has been selected to be a part of the intervention arm of the study, meaning that all health care workers (including physicians, nurses, technicians, physical therapists, food and nutrition services and environmental services) must gown and glove before entering any patient's room in 71 ICU. "When patients are in contact isolation because of antibiotic resistant bacteria such as methicillin-resistant Staphylococcus aureus (MRSA) or vancomycin-resistant enterococci (VRE), standard protocol is to gown and glove before entering the room," says Jesse Jacob, MD, assistant professor of medicine, Division of Infectious Diseases, Emory University School of Medicine and associate hospital epidemiologist at Emory University Hospital Midtown. "Because these bacteria can spread from patients to the surfaces in patient rooms, if proper precautions are not taken, they could potentially be transmitted to the next patient. The BUGG Study aims to determine whether using gowns and gloves for all patient contact decreases the acquisition of antibiotic-resistant bacteria and health care-associated infections," says Jacob, who is the principal investigator at EUHM. As patients are admitted to the unit, they are screened to see if they already have MRSA and VRE on their bodies. Many people have these or related bacteria on their skin or elsewhere in their body without knowing. They are screened again when they leave the unit. Researchers are looking to see if universal gloving and gowning is a more effective strategy to prevent patients from acquiring antibiotic resistant bacteria. Proper hand hygiene before entering each patient's room, and then again upon leaving the patient's room, is still required, even with the use of gloves and gowns. Health care-associated infections accounted for an estimated 1.7 million infections and 99,000 associated deaths in 2002, according to the Centers for Disease Control and Prevention (CDC). Of the figures, intensive care units are the highest risk environments for these infections and acquisition of antibiotic-resistant bacteria. These infections are associated with considerable illness, death and high costs among hospitalized patients. 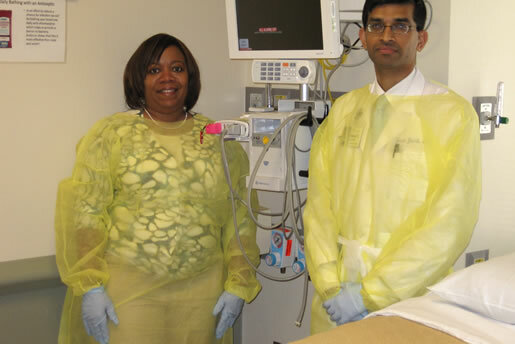 "Despite taking an extra effort to glove and gown before entering patients' rooms, the intervention may work to prevent infections and the transmission of antibiotic-resistant bacteria," says Georgia Jackson, BSN, RN, MPH, unit director of 71 ICU. "Our unit is excited to have been selected to participate in this important study." Besides taking extra time and effort, universal gloving and gowning can have negative consequences. Patients can feel more isolated, may be examined less often and some experience depression. "Part of the BUGG study includes monitoring for the unintended consequences of universal gloving and gowning," says Jacob. In 2010, Jackson and the 71 ICU team received the prestigious Beacon Award for Critical Care Excellence from the American Association of Critical Care Nurses (AACN). The achievement acknowledges individual critical care units that meet high-quality standards and provide exceptional care to patients and patients' families, while fostering and sustaining healthy work environments. The Agency for Healthcare Research and Quality is funding and overseeing the nine-month BUGG study in collaboration with the CDC. "This study could potentially change the way we handle infection control in hospitals," says Jacob. "We hope it will also lead to better outcomes for ICU patients." Site co-investigators, along with Jacob and Jackson include: Kenneth Leeper, MD, medical director of 71 ICU and Elaine Chang, NP, lead affiliate provider on 71 ICU. The study is also looking at healthcare-associated infections rates, including ventilator-assisted pneumonia (VAP), central-line associated bloodstream infection (CLABSI) and catheter associated urinary tract infections (CAUTI).